Super Savings Item! Free Shipping Included! 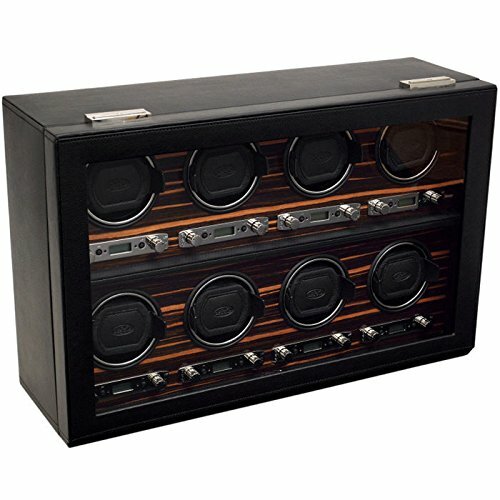 Save 37% on the WOLF 459356 Roadster 8 Piece Watch Winder with Cover, Black by WOLF at Social Seeker. MPN: 459356. Hurry! Limited time offer. Offer valid only while supplies last. 459356 Features: -Rotation Options: Can be set between 300 and 1200 TPD (Turns Per Day). Double the amount of TPD by selecting bi-directional. 459356 Features: -Rotation Options: Can be set between 300 and 1200 TPD (Turns Per Day). Double the amount of TPD by selecting bi-directional. -Delayed Program Start: Start delay options from 6 hours to 72 hours. -Watch Cuff: The cuff has been designed to fit bigger and heavier watches (up to 52 mm case). The new design "locks" the cuff into the rotator drum for a secure fit. -Battery Option: Runs solely on AC power (universal adapter included). -Storage: 8 winding modules. -Other: Locking glass cover and backlit LCD display. Product Type: -Watch box. Shape: -Rectangle. Style: -Contemporary. Finish: -Black. Interior Material: -Wood. Exterior Material: -Faux leather. Dimensions: Overall Height - Top to Bottom: -13". Overall Width - Side to Side: -20". Overall Depth - Front to Back: -6.5". Overall Product Weight: -30 lbs.